Combines 4 cups water and 4 cups ice cubes in large bowl; set aside. Place eggs in large saucepan, and water to cover by 1 inch, and bring to boil over high heat. Remove pan from heat cover, and let stand for 8 minutes. Pour off water from saucepan and gently shake pan back and forth to crack eggshells. Transfer eggs to ice water and cool form 5 minutes. Peel eggs and halve lengthwise. Transfer egg yolks to large bowl. 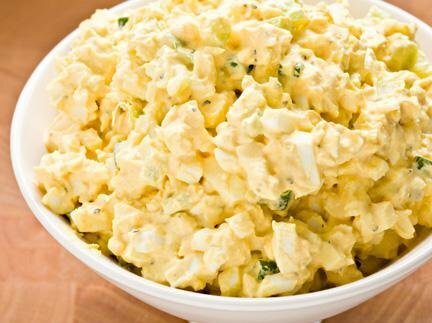 Using potato masher, mash yolks with mayonnaise, lemon juice, mustard, ¼ teaspoon salt, and 1/8 teaspoon pepper. Whisk mixture until smooth; set aside. Reduce mayonnaise to ¼ cup. Replace Dijon mustard with 2 tablespoons spicy brown mustard. Add ½ teaspoon paprika and ¼ teaspoon hot sauce to egg yolk dressing in step 2. Omit celery and parsley. Omit celery, chives, and parsley. Add ½ cup thinly sliced radishes and ½ cup chopped baby arugula with egg whites in step 3. End.